One tiny red leaf and a three inch stem was all that was left of my mini poinsettia last January. As I approached the trashcan with plant in hand ready to toss, I felt a pang of guilt: how could I throw out this plant who was still trying to live? Instead I decided to repot the scrappy plant and placed it by a sunny window. After a week or so, I saw the poinsettia express gratitude through a new leaf at the top of the stem. I could almost hear the plant say, “I think I can, I think I can.” The plant stood humbly in it’s new gold pot with a total of two green leaves. Still scrappy, yet growing stronger. 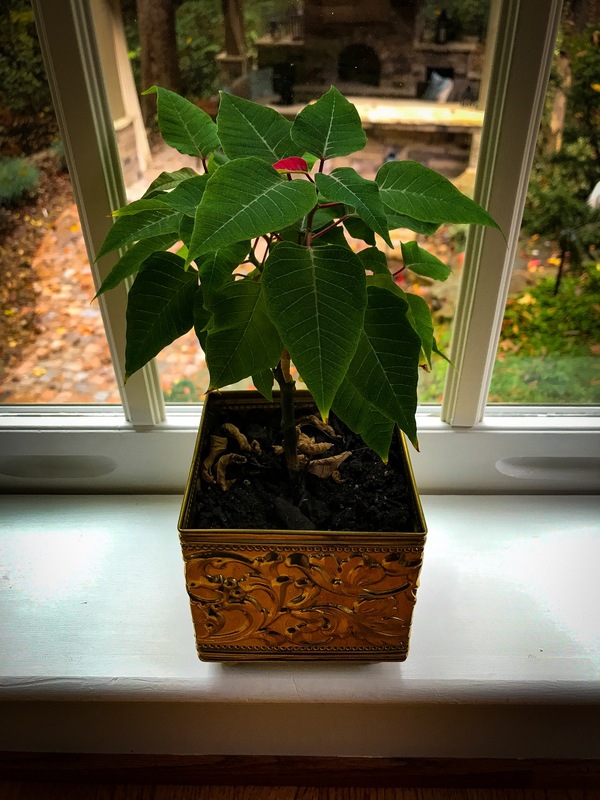 As the weeks went on and then months, my little poinsettia grew taller, displaying pride through many new leaves. And I enjoyed being attentive, watching the slow but steady progress. Fastforward to last week, when I heard my first Christmas song on the radio and decided that I just wasn’t ready and turned the radio off. On the drive home, I thought about “the rules” for the holidays. Halloween once rolled into Thanksgiving, with the Christmas season beginning on the heels of Turkey dinner. Now Halloween is like the forward to Christmas; as kids count their Halloween loot, retailers put up Christmas trees and lights. My thriving green poinsettia also decided to start celebrating the Christmas season. While watering and fertilizing my plants in the sunroom, I was elated to see one green leaf turning red. Since I had never looked up any care instructions, I was completely surprised. I now know that poinsettias start turning red when they have at least 12 to 14 hours of complete darkness. Placing rules aside, the word that came into mind was hope. What I saw and felt from that green leaf turning red was hope. Hope blossoms not only when you give it time, but when you give it attention as well. I thought about how my little poinsettia was a symbol for hope. Just when you think you are ready to give up on something or someone, stop and look for the potential. When you neglect something or someone that you once cared for, when you stop being present, you come dangerously close to throwing it all away or appearing as if you just aren’t invested anymore. When you give your attention, what you focus on expands. In my poinsettia’s case, she grew an abundance of green leaves. And I like to think that she turned a green leaf red to express her gratitude.